Jakarta, May 14th 2013 – Setting their sights on one of Jakarta's most happening districts, favehotel Puri Indah is the latest hotel from the stylish brand located in West Jakarta. The opening event was attended by the Mayor of West Jakarta, Mr. Anas Effendi along with other local dignitaries. As the capital and largest city of Indonesia, Jakarta is the country's economic, cultural and political hub filled with exciting nightlife and vibrant shopping areas. It is also the most populous city not only in Indonesia but in Southeast Asia, and serves as a melting pot of Indonesian and Asian culture. With a continually growing market for superior budget hotels, favehotels are increasing their presence in this buzzing capital city. This time, the brand are opening up in West Jakarta with an address conveniently close to the toll highway, government buildings and international schools. 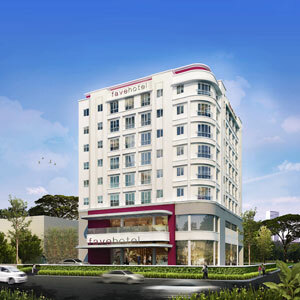 favehotel Puri Indah will also be close to a number of noteworthy shopping malls including Hypermart, Carrefour, Puri Indah Mall and Indonesia's largest shopping mall, "Mall Taman Anggrek" (Orchid Garden Mall). The hotel is also just a 30 minute drive from Soekarno Hatta International Airport. The 108 stylish rooms are modern, functional and super-clean offering cutting-edge LED TVs, fast and reliable complimentary WiFi, security key card systems, air conditioning, in room safes and top-of-the-line beds with high knot count cotton linens. The ultra-modern bathrooms come equipped with combed cotton fully towels and modern bath amenities. For business and leisure travelers, the hotel also includes 5 modern meeting rooms and 1 board room, an all day café-shop serving a wide variety of international and local cuisine, as well as ample parking space. “favehotels are attractive budget hotels with a chic design and a trendy concept. They are super clean, professionally managed and blow most five star hotels away when it comes to “truly” high-speed free internet and quality beddings. We believe favehotel Puri Indah will become the hotel of choice for Jakartans and visitors alike, especially those who enjoy a modern lifestyle, a minimalist style and have an eye for value for money.” Says Norbert Vas, Vice President of Sales & Marketing. Exterior of favehotel Puri Indah – Jakarta. 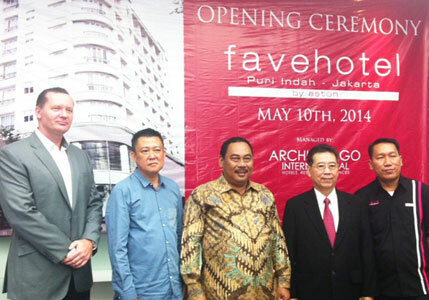 Soft Opening favehotel Puri Indah - Jakarta, seen in the picture from left to right Mr. John Flood - Presiden & CEO of Archipelago International, Mr. Emir Zarry & Mr. Yohanes Harianto - Board Commissioner of PT. Duta Wahana Gemilang, Mr. Anas Effendi as the Mayor of West Jakarta and Mr. Anday Wiryawansyah - Hotel Manager of favehotel Puri Indah Jakarta during the Soft Opening Ceremony. favehotels currently operates 27 hotels throughout Indonesia and Malaysia out of which 9 are in Jakarta and 4 in Bali and has a development pipeline of more than 40 hotels in Indonesia, Malaysia and the Philippines.